The Bureau of Fire Protection only has one Arson Laboratory in the whole Philippines. Any evidence in a fire from any part of the country that needs to be investigated upon would still have to be sent to the Arson Investigation Unit in the BFP main office. The Arson Electrical Division, being manned by electrical engineers, look into the various cables, appliance motors such that of electric fans, and machines used on generators that are submitted as evidence. They will determine how these items got burned and if they had been the cause of the fire. Probing these pieces of evidence in a fire is not an easy job as almost all pieces submitted to the Electrical Division are already beyond redemption. The BFP admitted that although they have magnification devices, they still need an electron microscope. On the other hand, accelerants or chemicals that could easily cause fire are being handled by the Arson Chemical Laboratory. The BFP personnel assigned in this unit have science background. They use state-of-the-art gas chromatography machine that costs 10 million pesos. The gas chromatography machine can check even the ashes that remained in the fire. Insp. Ferlyn Cabral, the Chief of the Forensic Chemistry Unit of the BFP said, “kapag sinalang po dito sigurado po kaming makakakuha pa kami kasi parts per million yung sensitivity po. Bale dito po kasi i-subject natin sa heat through sa head space tapos hihimay-himayin po siya up to the molecular level, tapos inject po sa GC para maidentify po natin kung ano ang meron dun na flammable substance. The BFP is undergoing modernization not just on firetrucks but also on new technological equipment of arson investigators. 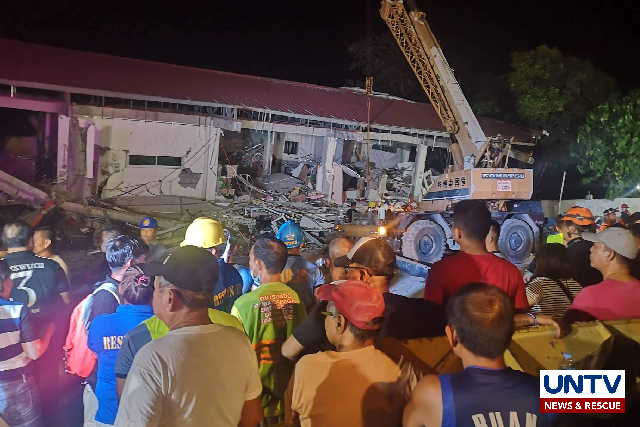 It has been two days since a four-storey building in Porac, Pampanga collapsed during the 6.1 magnitude earthquake that jolted several parts of Luzon on Monday (April 22). Rescue experts say that an individual’s chance of survival has no exact limit. Sometimes, they can last up to 24-hours. Their survival will depend on their physical capabilities, health, and age. With this in mind, rescuers including the Bureau of Fire Protection (BFP) Region III continue to search for survivors beneath the rubble of Chuzon Supermarket. BFP Region III Director SSupt. 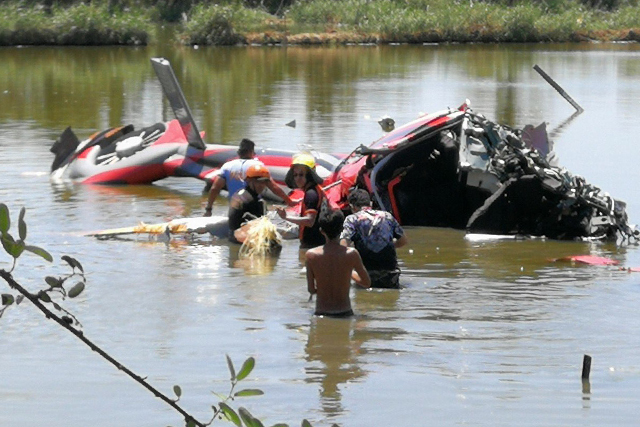 Samuel Tadeo still hopes to rescue more survivors. “We still believe in miracles. Baka lang po naman, pinipilit lang po natin (Just in case [there are still survivors], we’re doing everything we can). Panalangin nalang na sana wala nang naiwan sa loob (We pray that no one gets left behind),” he said. Rescuers drilled holes into debris so that the air and light can enter the collapsed building, making it easier for them to locate survivors. They also used thermal scanners and K-9 dogs. However, according to Philex Mining underground safety supervisor, Abel Juandagan, it might already be impossible to locate survivors given the state of the building. The Philex Mining rescue team is among the responders who went under the collapsed building to look for survivors. Several residents of Brgy. Damayang Lagi in Quezon City rummage through ashes and burnt debris after a fire broke out on Wednesday. It was their home, or what’s left of it. 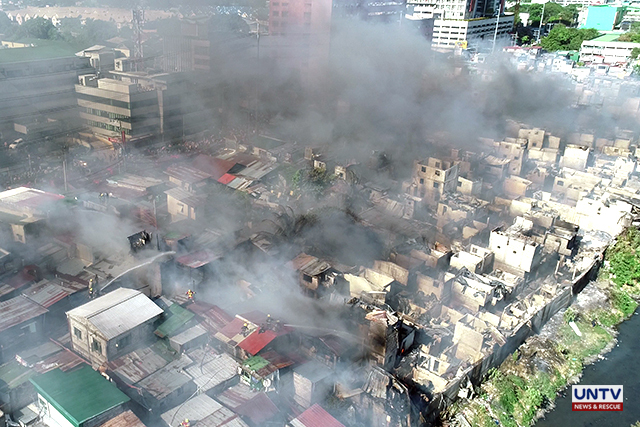 The Bureau of Fire Protection (BFP) said 750 families were affected by the fire, with P2.5 million worth of damage. These residents still returned, hoping that there might still be something left to save. With the slate burnt to ashes, they have to rebuild their lives once again. Paulino Yberzaba, a resident, lined up in the barangay office because he was suffering from high blood pressure. Even if he is in a wheelchair, he still patiently waited for medical assistance. He was wearing unmatched slippers. Paulino was not able to save anything from the fire, just the clothes on his back. Only a stone wall is left of his home, but still, he is thankful because his wife and children are safe. However, Paulino laments the difficulty of starting anew. “Kung mayroon makatulong. Ako baldado na ko. [walang perang] maibili ng gamit, (if there is someone that can help. I am already disabled and we have no money to buy clothes)” he adds. A doctor, several nurses and midwives visited the area to assist residents in need of medical attention. Food and water assistance were also distributed. “Mayroon nang mga na-high blood, may mga ubo’t sipon, nilalagnat, inuubo. May mga nasugatan (Some [residents] are suffering from high blood pressure, other have colds and fever. Others are injured)” Jocelyn Ledanga, a midwife, said. As of this writing, the local government has provided more than 10 temporary shelters for the victims. Said shelters can accommodate two to four families each. Another resident, Zoraina Mamasalen, is content with the help of the government. “Okay naman po. Maayos naman po iyong assist ng barangay kapitan po namin, (Things are alright. Our barangay captain is assisting properly)” she said. Zoraina is among the residents who were able to stay at these temporary shelters. Others, however, are not so lucky. 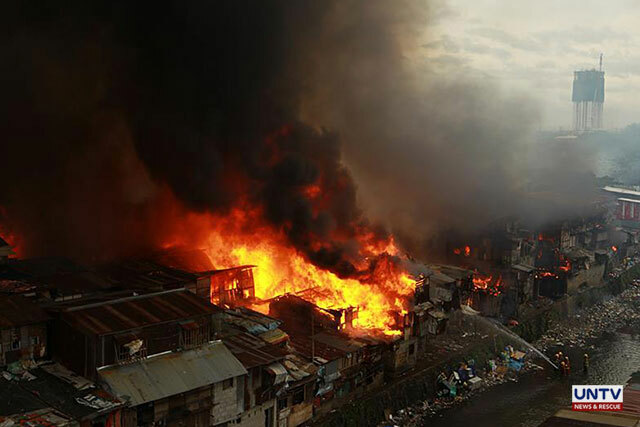 There are no proper evacuation centers that can accommodate all the residents affected by the fire. Some of them had no choice but to stay in the streets, with nothing to do but wait for help to arrive. The relief and cash assistance that are meant for these residents, however, were taken by individuals posing as victims of the fire. Barangay Captain, Boy Tanyag said financial assistance range from P1,000 to P2,000 or more. But there are individuals who list themselves as victims in order to avail of these aid. “Isang pamilya lang. Nagpapalista limang tao. (In one family, there are five individuals who register)” he said. The BFP continues investigation on the cause of fire. They said it might be due to problems in the power lines. 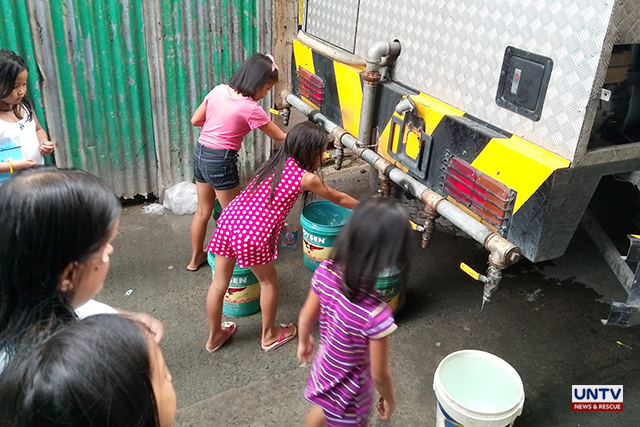 The Bureau of Fire and Protection (BFP) reminds residents not to drink the water from firetrucks, as several fire departments provided water to residents experiencing water shortage. BFP Spokesperson Fcinsp. Jude del Rosario said that only the water from fire hydrants are safe to drink but they cannot assure the public about the water from their firetrucks. “It’s not for drinking. Puwede pampaligo, panghugas ng plato. They have to boil it for one to two hours para masiguro na walang bacteria na nakasama before nila inumin o gamitin (It’s not for drinking, you can use it for bathing or cleaning the dishes. If they are going to drink it, they have to boil it for one to two hours to make sure there is no bacteria in it),” he said. However, the BFP clarified that they are not mandated to provide water during water shortages unless the local government requests for it. “Iyong pupunta lang kami doon para mag-provide, hindi iyan kasama sa mandate namin, kasi we don’t want to compromise our firefighting capability. The National Capital Region is the highly populated area na dapat naming mino-monitor. We are always on the alert status dito sa NCR (Going to residential areas to provide water is not our mandate. We don’t want to compromise our firefighting capability. The National Capital Region is a highly populated area that we are monitoring. We are always on the alert status here in NCR),” Del Rosario said. Meanwhile, the Philippine National Police (PNP) calls on areas experiencing water service interruption to stay calm. They are also ready to provide security in areas where water is rationed. “Sa lahat ng mga kababayan natin ngayon na nasa pila palde at mainit ang ulo, ang amin pong pakiusap ay panatilihin ang kaayusan, kahinahunan ng isip at damdamin. Anytime po ay nakahanda ang PNP personnel na umalalay sa lahat ng mga distribution points sa buong Metro Manila at sa karatig na lugar (To all our fellowmen who are frustrated by the situation, please remain calm and maintain order. The PNP personnel is ready to assist in distribution points in Metro Manila and in nearby areas),” PNP Spokesperson Bernard Banac said.